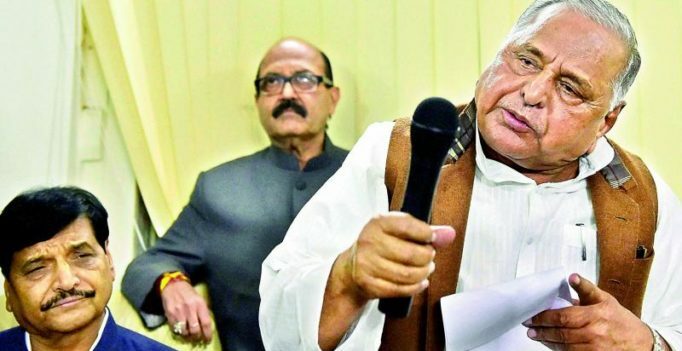 Lucknow: Samajwadi Party patriarch Mulayam Singh Yadav, on Sunday, added to the prevailing confusion in the Samajwadi Party when he told party workers that there was no dispute in the party. He asserted that he was still the party chief. Mr Yadav, along with Shivpal Yadav, visited the party office and got his and Shivpal’s rooms locked. The name plate of the two leaders was also restored after it had been pulled down by Akhilesh supporters. Mulayam Singh Yadav took the keys of the rooms before leaving. The two leaders later left for Delhi where they are scheduled to meet the Election commission on Monday. State president (Akhilesh faction) Naresh Uttam clarified that the name plates had never been ripped off. Expelled MLA Udaiveer Singh (Akhilesh faction) told media that the real party was behind Akhilesh Yadav and they would contest the election-with or without the cycle symbol. Meanwhile, cycle, the symbol of Samajwadi Party, faces the threat of being frozen before the Uttar Pradesh Assembly polls if the Election Commission is not able to decide which of the two factions of the party commands majority in the organisation.